The Lambda sensor of probe is a part of the electronic fuel injection system that is placed in the exhaust of a car equipped with a petrol engine. It measures the amount of oxygen that is still present in the exhaust gasses. 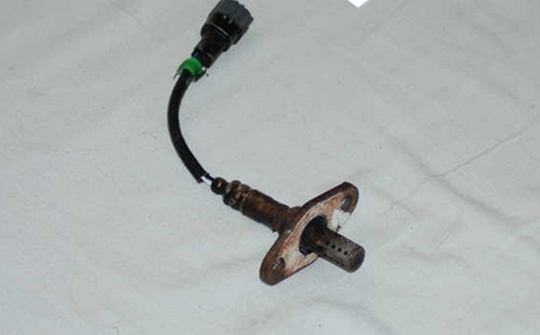 Lambda sensor of a Toyota Corolla. When car manufacturers made the transition from carbureted engines to engines equipped with fuel injection in the '80's and '90's, the ECU's of those cars needed an increasing amount of sensor data to be able to accurately control the air/fuel mixture. One of those sensors is the oxygen sensor (O2 sensor) or lambda sensor. The engine management needs feedback from the lambda sensor to be able to determine if the amount of fuel it injects into the engine is correct. The engine management is always trying to achieve the optimal air/fuel mixture (14,7 part of air for every part of fuel; 14,7:1). If the mixture isn't correct, it can compensate for this by altering the amount of fuel injected. If the amount of air in the exhaust gasses is to much, the engine is running to lean and not enough fuel is injected. If the amount of air in the exhaust gasses is to low, the engine is running to rich and to much fuel is injected. The Lambda sensor measures the difference in oxygen between the ambient air and the exhaust gasses coming from the engine. The sensor itself is hollow and has a air side and a exhaust gas side. There are openings on both sides to let the air and exhaust gasses enter the sensor. Inside the sensor, both sides are separated by a ceramic part made of zirconium oxide. This can withstand the heat of the hot exhaust gasses and isn't electrically conductive. 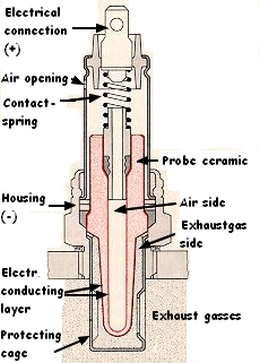 Cut-out of a lambda sensor that shows it's construction. Because of the oxygen difference between the air and exhaust side of the sensor, it is capable of generating a small electrical voltage, varying between 0,1 and 0,9 Volts. When an optimal burn of the air/fuel mixture is reached (an even mixture of air and fuel with a 1:14,7 ratio) the Lambda value is known as '1'. At Lambda 1, the sensor will generate approximately 0,5 Volts. A Lambda sensor will only start to give accurate measurements when it is warm. The sensor needs heat to generate reliable voltages for the ECU to work with. It needs to warm up to about 350ºC to work properly. The sensor needs to be heated up by the exhaust gasses passing through the exhaust system. This takes a few minutes when the engine is started 'cold'. The ECU knows that the Lambda sensor needs time to warm up, so it ignores the signals it gets from the Lambda sensor the first few minutes. Running without the feedback of the Lambda sensor like this, the ECU is running in a 'open-loop' mode. Without the signals from the Lambda sensor, the ECU can't make any adjustments to the fuel injection based on oxygen levels in the exhaust gasses. Running in 'open-loop', the ECU uses values programmed into it's memory by the manufacturer. When the Lambda sensor has warmed up to operating temperature, the ECU will start running in 'closed-loop' mode and can make small adjustments to the fuel injection to achieve optimal burn in the cylinders. Modern cars have Lambda sensors with build in heating elements with the sole purpose of heating up the sensor the operating temperatures a lot faster. The ECU can use the input from the Lambda sensors a lot faster and start adjusting the air fuel mixture. This helps to bring the engine emissions down faster. At least one Lambda sensor is located before the catalyzer, so the measurements aren't affected by the catalyst itself. Older cars use only one Lambda sensor, but modern cars can use of to 4 or even 5 Lambda sensors in the exhaust system. These modern cars have a lot more components in their exhaust systems (like catalysts) to help bring emissions down. The Lambda sensors can be used to monitor the performance of these parts.